Title: The Big Calaca. Medium: Brazed Steel wire, cotton, compact fluorescent, 12 volt wheelchair battery, bike cart. Date: 11/04/2011 Dimensions: 13' tall Description: The Big Calaca 2012 was a rather painfull year, a dear friend passed away in the early part of the year. He was a rather remarkable person and in his honor I produced this huge lantern. 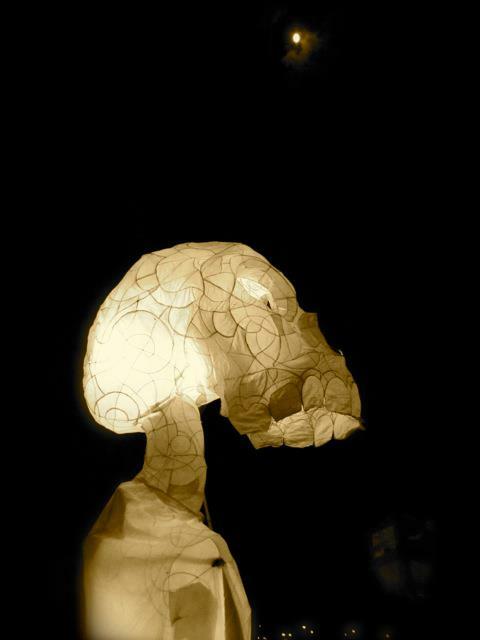 It was featured in the All Souls Procession and built during numerous lantern making workshops I organized for the procession. The Big Calaca was mounted on a bike cart and powered with a twelve volt battery. My friend who this was built to honor was one of the original Cockettes and a real forerunner in the gay rights movement. I miss him deeply.